Including why he took on the role, marketing BlackBerry 10 and more! Research In Motion's new Chief Marketing Officer has only been on the job for four weeks, but he has hit the ground running. As we learned from RIM's CEO Thorsten Heins, Frank Boulben has already presented his marketing plan for BlackBerry 10 to management and the board and everybody is excited for it. RIM has been without a CMO for a long time now, and even when the position was filled BlackBerry's marketing has been one of those areas that the CrackBerry community has been highly critical of over the years. A new CMO with energy and smart ideas is something BlackBerry has been desperately in need of. Sitting down with Frank, it's clear that he gets it. I walked away from this interview feeling much more confident that RIM will really be able to not only bring a compelling product to market in BlackBerry 10, but also market it in such a way that people will want it. I probably should have stopped at 10 questions in honor of BlackBerry 10, but my list of questions was long and I managed to work in 12 before Heins dropped by to join the discussion (if you missed that editorial, read it here). 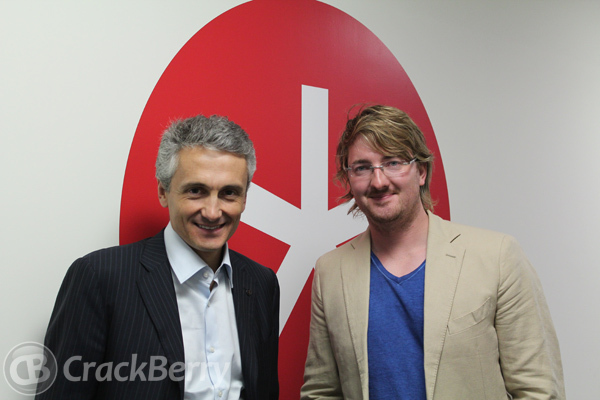 Big thanks to Frank for sitting down with CrackBerry for this! Q1. Some would say you've probably accepted what currently is the toughest job in tech today... the CMO position at RIM. Why did you take on the challenge? Frank: First because I believe we have all that is needed to be successful. Before I took the role obviously I did my own personal due diligence. I reached out to the carrier community on three continents. I reached out to the developer community. Both gave me the same very positive feedback. The wireless carriers absolutely want RIM to be successful. They want more diversity in terms of ecosystems. They have a huge install base with us and they want to and continue and upgrade that install base. And we have a longstanding relationship with them, so they want that to continue. So on the carrier side -- developed markets, emerging markets -- there is very strong backing, and as you know having the carrier support is absolutely critical for a successful go to market. And on the other side, the developers were extremely positive about the platform. We have 78 million users. They expect those users over time to be on BlackBerry 10. The developers are really excited for what the platform is offering - if you want to develop rich applications you can use Cascades and C++ SDK. If you're more of the HTML 5 school you also have an SDK there that is leading edge. And if you don't want to dedicate more than a couple of days to port an app to BlackBerry 10, you can port your Android apps and use the Android runtime environment. And if you combine that with billing relations we have with carriers, it's an attractive platform for developers. The BlackBerry Jam tour has been very successful, we're quote "sold out everywhere" and each time it generates a lot of excitement. That's a long answer, but it was the first element for me to be sure the partners were supportive of BlackBerry. So the carriers were. The developers were. Then when I look at the company, the brand is still extremely strong globally. We have a weakness in the US right now, but when I look at it globally, we are #1 in South America, we are #1 in South Africa, in Nigeria, in the Middle East and some Asian countries. We are still in a solid position in Europe, so overall the brand is in a very good position, and it's an iconic brand. We have growth everywhere in volume, except in North America, so there is still a lot of attraction for the brand and the products. The company is financially healthy. We have a strong cash position. No debt. We are still cash flow positive. We are engaging in a cost reduction program that will increase our financial flexibility as we transition into BlackBerry 10. And for myself, under NDA, I saw demos and mockups of BlackBerry 10 devices so I could judge by myself and I really think BlackBerry 10 is the step change in the smartphone user experience. We've been living now for five years in a paradigm that is the in and out paradigm. You have a page with icons, you click on one icon to get into an app, and then the only way to exit is to press the home button and then you go into another app. That paradigm was great -- it's still great -- but what we are going to introduce is the next generation of user experience on a smartphone where you are always in. You don't need to get out of an app to get into another one. It's a seamless and continuous flow with one's gesture. That will be a very powerful experience. When our fans first, and then customers and prospects see it, they realize how powerful it is. That's a long answer to your question, but carriers and developers being supportive, a great brand, a strong and healthy financial position and a great product experience to come. And in terms of employees and management, I think we have lots of talent in RIM. We need to make sure we're all focused on the same objective, but that was also very comforting for me. I met many people before I joined... I must have had almost a dozen meetings. I was very interested in the roll, and now having been four weeks in the company I have had no bad surprises whatsoever, and I'm still confident we are on the right strategy and BlackBerry 10 will be the source for long term success and value creation for our shareholders who are screaming for it. Q2. What are the first things for you to tackle as CMO? Frank: The first big thing is to get the marketing plan for the introduction of BlackBerry 10 right. So that's the absolute priority, and I've assembled a team that is composed of functional leads in different areas of marketing, and also I've associated to it all of the country and region marketing leads, and we work as one unified team. So what I want to do with BB10 is get away from the fragmentation we have today in the management of the brand and our marketing activities so that we can fully leverage our scale and scope globally with the introduction of BB10. So preparing all of the elements of that marketing plan, that is the absolute #1 priority. At the same time, I'm in building a world-class marketing team. I think we have many talents inside the company, but we are going to have an organization that operates differently and is organized differently (than in the past). So that's my second big task. The third is to continue to support the growth of BlackBerry 7. We have a portfolio in the market. There are many markets where we have very strong growth, so we need to continue and sustain BB7. Q3. On that note, do you think there may be any confusion among consumers as BlackBerry 10 marketing ramps up and BlackBerry 7 marketing continues? Frank: I don't think there will be any confusion as BlackBerry 10 will enter the market at the high end of the smartphone category. And today the vast majority of the BlackBerry 7 portfolio is positioned at the entry segment and mid-range segment. Q4. One of the areas where the CrackBerry community has been most critical of BlackBerry over the years is in their marketing. Looking back, what kind of scorecard grade would you give them on their efforts? Frank: First of all, I'm not devoting much time to do a post-mortem of campaigns over the last couple of years in different countries. My high level view on that is that the quality was uneven. There was a lot of fragmentation. And that's it. I'm not going into the specifics of what was the return on a particular campaign, or how it was perceived, etcetera. I'm focused on moving forward to have a unified approach. The same creative framework across countries will be used for BlackBerry 10 so you won't see that fragmentation again, so hopefully the quality and creative thought will be there and we'll delight our fans. Q5. Leading up to BlackBerry 10, who do you feel it's most important to market to right now? Is it the carriers? Is it the end consumers to build back some brand equity, enterprises? Frank: You market first to the carriers, as the carriers have to test the devices and they have to prepare their own marketing activities. We are speaking to carriers now. What we want to do immediately after that is to engage directly with the end user, both consumer and enterprise, through different means. With enterprise we can have more direct contact through our sales force. For consumer the primary audience is our existing users -- we have 78 million BlackBerry users -- so informing them of what is coming in BlackBerry 10, giving them sneak previews of the user experience before the device is actually available will be important. Most of the people buying BlackBerry 10 devices already own a smartphone today and so we will also use mobile marketing quite a lot, to target them on their smartphone. And we know through the surveys we've done that today we have many smartphone users who are not satisfied with their current experience and who will want to migrate to BlackBerry. Q6. I hear you also have a residence in New York. If you walk into a Verizon store these days it can be difficult to find a BlackBerry. Are you confident we will see US carrier support with launch of BB10? Frank: First of all, let's address your example of Verizon. Yesterday we've announced a new device with Verizon, and so there is support from the carrier community. I cannot be specific, but we are very engaged with US carriers for the launch of BB10. And by the way, it's the same in every country. I couldn't name one country where we have carriers telling us not interested. So that's a clear sign of confidence. And for the BlackBerry 10 introduction, we'll be working with the carriers on a comprehensive program -- joint marketing effort, below the line effort -- so materials for point of sales, upgrade programs, retention programs and etcetera. So that will be a comprehensive effort, for consumer and enterprise. Q7. So that leads me to my next question, and it's one our community has been asking a lot... if I own a BlackBerry Smartphone today, and I know I'm going to have to wait until 2013 until I can buy a BlackBerry 10 phone, are there going to be incentive programs or trade up programs to make me hold onto my BlackBerry the next six months? Q8. How do we win back the mind share in the US? Frank: When I look at our US customer base, we still have a very strong fan base across segments -- business people, artists, young people -- we're growing in the pre-paid market as we speak. So it's not like we're not present in the US market. We still have that strong base. The key for us, as soon possible, will be to put that new user experience in their hands, and let them do the marketing so to speak. That will amplify it. That's the way to approach it. Q9. I'm not sure you're going to have an answer for this one but I'm curious... BlackBerry 10. One of the questions I get asked a lot is Why BlackBerry 10 and what happened to 8 and 9? Then I have to explain to them about BlackBerry and QNX and BBX was the coming together of both names and then there was trademark issue so they couldn't use BBX, so now it's BlackBerry 10. But that's not much of a marketing message. So why BlackBerry 10? Frank: [ both of us laughing a bit at my run on question as Frank begins to answer ] So I was not in the company so don't know the exact genesis but my interpretation simply is that we were single digit before -- BlackBerry 5, 6, 7 -- and given that it's a change of generation that we go double digits. Kevin: I like that. So my thoughts were that it's going to get a 10 / 10 on all the reviews. Kevin: Or I have heard the line in the past couple of weeks that once BlackBerry 10 is to the market it's a platform to build on for the next 10 years. Frank: Yep, and from a marketing standpoint, 10 is a great number. Q10. On the topic of loyalty. I'm always a BlackBerry fan. Some days that's easier than others, but I've always maintained my loyalty and want to see BlackBerry succeed. On the other hand, we have seen a lot of users leave BlackBerry (and I get mad that they're not as loyal as me). So what are people loyal to? Is it BlackBerry the brand? Is it the product? Is it the company? Does having a company name like Research In Motion that is separate from the brand, BlackBerry, make people less loyal than say a company like Apple where the brand and company are one and the same? I know that's not a great question... errr.. so how do you build loyalty long term? Frank: We want to build loyalty around the BlackBerry brand. The mega brand, to use in advertising jargon, is BlackBerry and in all of our marketing activities moving forward you will see the BlackBerry name taking an even more central position than it has in the past in all aspects of marketing and naming. But fundamentally to your question, the brand is what it does. A brand is what people say when you are not in the room. And that is formed by the user experience. BlackBerry is a great brand because it delivers to you and me a great experience for what we expect from a smartphone. If we continue to deliver that, the brand will continue to be vibrant. Q11. Is there anything you want to tell our audience of long time BlackBerry fans who are frustrated right now to keep holding on? Frank: First of all, I want to thank them for being loyal BlackBerry fans and users. The thing I would like to tell them first is that we're putting all of our efforts into developing this next-generation smartphone experience I was talking about so we can delight them once again. What I intend to do, as soon as practical and possible, is to show them what the experience will be about. Even before the device is available, so that they can realize by themselves that we are really introducing a step change in the smartphone market. So that will be done through digital assets, videos demonstrating what this seamlessness, always-in paradigm will be. Q12. Last question. If your marketing efforts are successful, a year from now, when people hear the name BlackBerry or see a BlackBerry phone, what do you want people to think? What values do you want the brand to instill in you? I guess what I'm really asking here is... What does BlackBerry mean to you? Frank: It helps me to get things done, better, faster than any other smartphone.